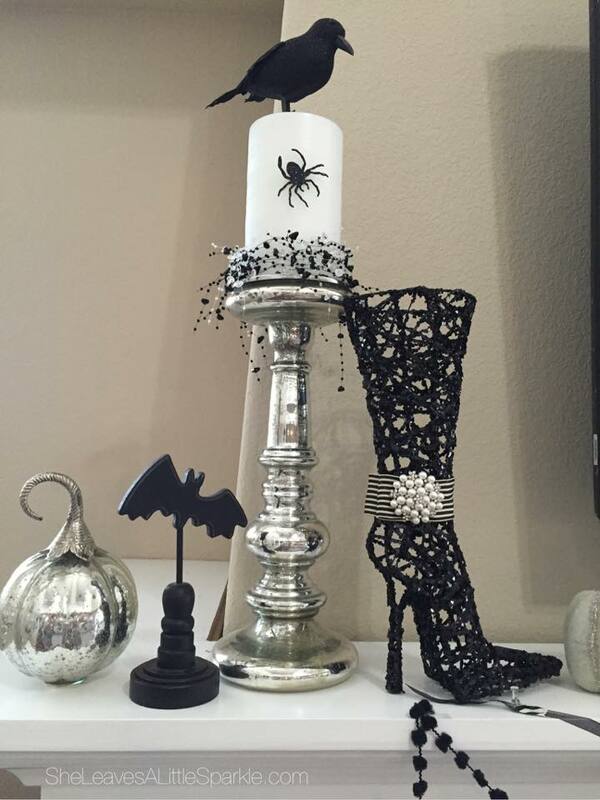 Normally, I’m the first one I know to get my Halloween decor up BUT this year I’m sooo late! I just NOW finally have it all up which means I’ll only get to enjoy it for a couple more weeks. Eek! Better late than never, right?! 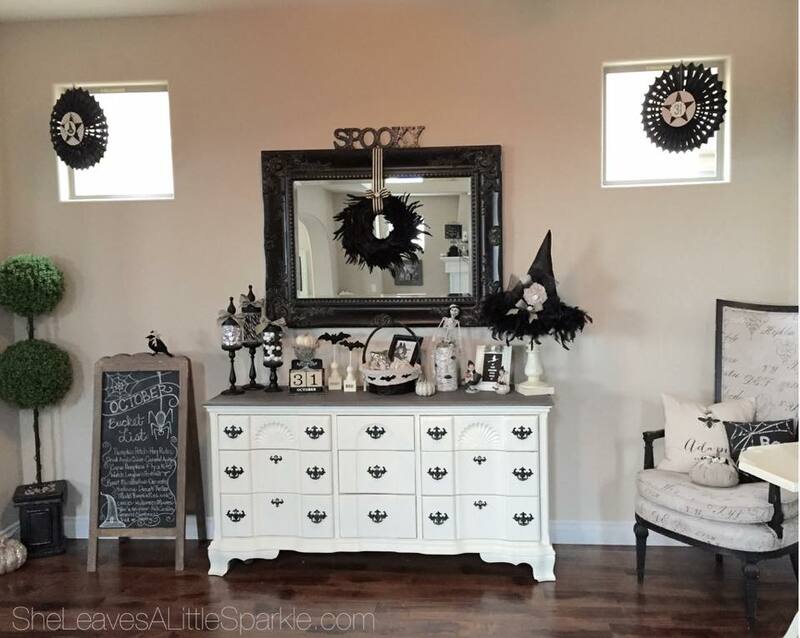 Come with me and I’ll take you on a little Halloween tour in my home! That glittery witch’s boot (above) is glittery and sparkly. I bought it at Rod Works years ago and it’s still one of my favorite pieces. I added the embellishments. I also bought all of the sparkly candle strands there also. I use them throughout my home year-round. 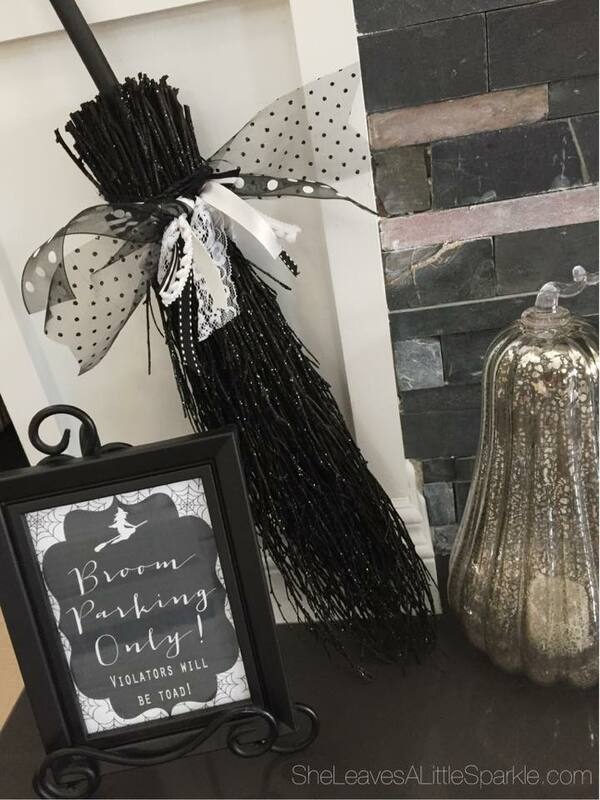 I love this witches broom! I was tempted to make my own this year (after my last one fell apart in a move) but then, again, I walked into Rod Works and they had one on sale! 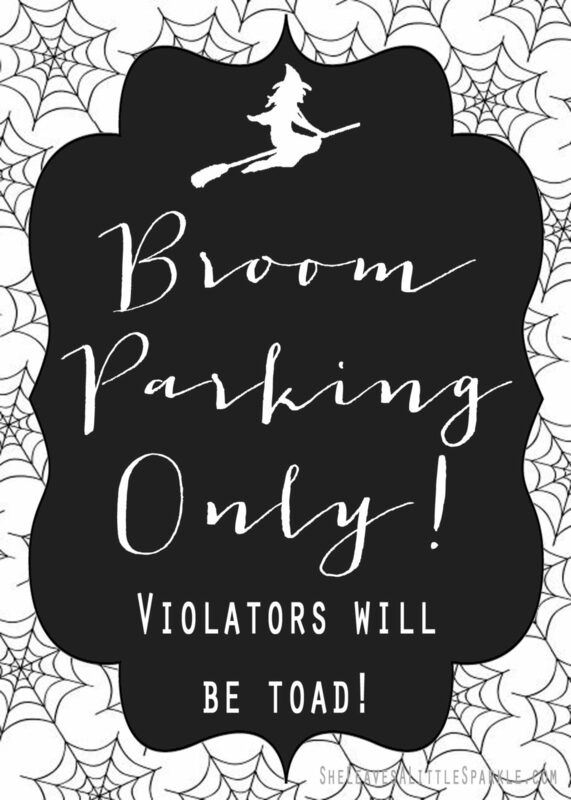 How cute is this Broom Parking Sign?! I am sharing it with you for FREE (for personal use only) and all yours to use in your home! Right click on the image below and save to your computer. Then, you can print it in any size and add it to a frame. 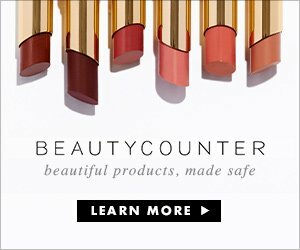 Pin it if you love it and share! 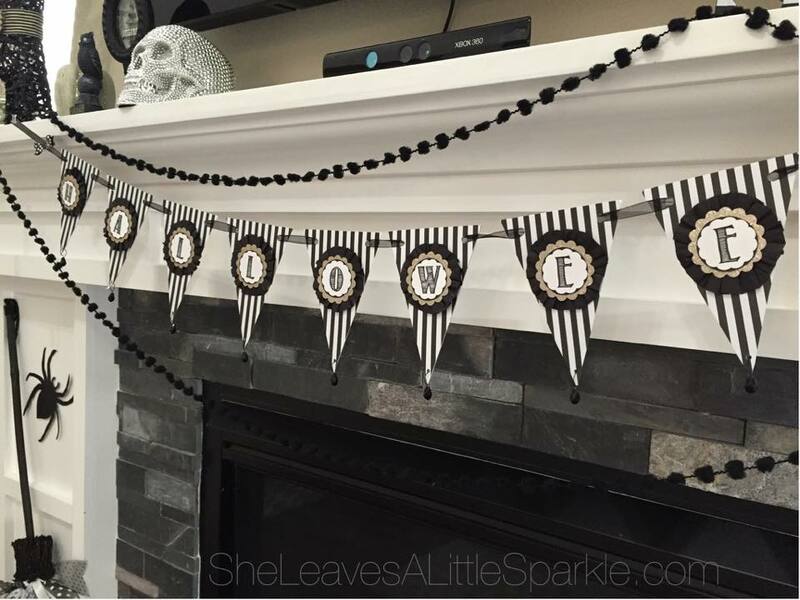 I made my own Halloween banner by adhering scrapbook striped paper onto chipboard pendant flags. 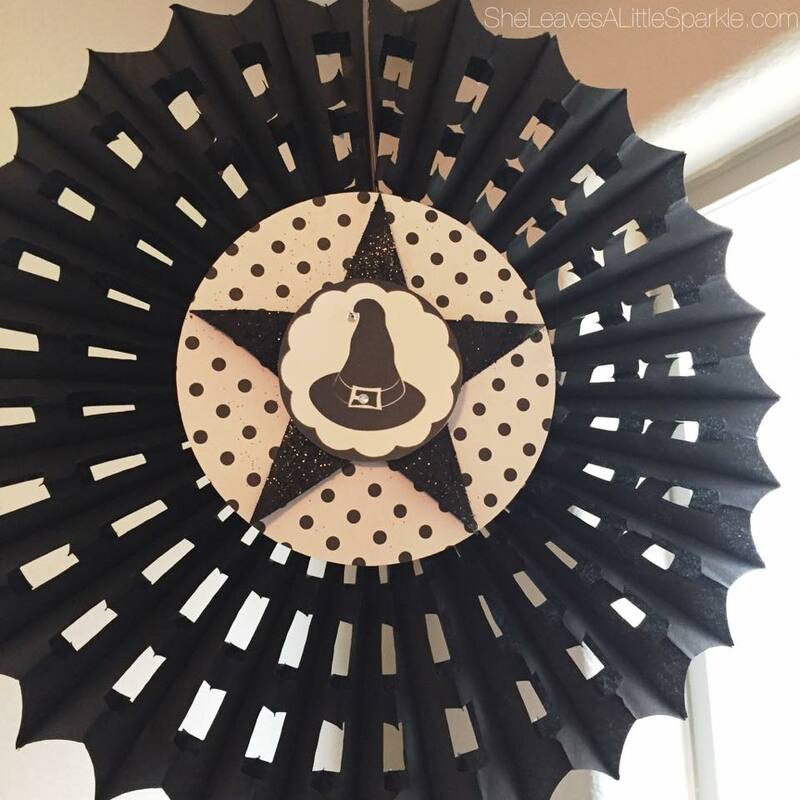 I used my Silhouette Cameo to cut out the center embellishments. 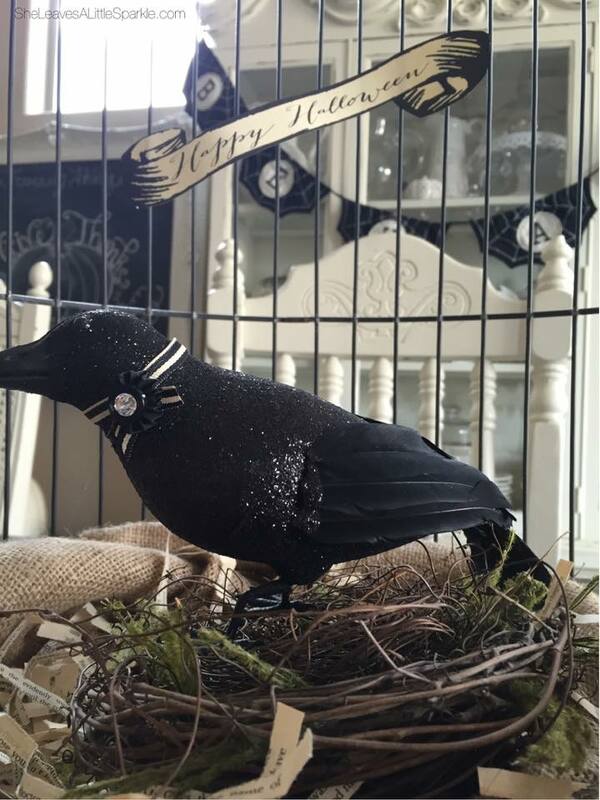 I hole-punched tiny holes in the bottom points and used jewelry wire and black tear-drop jewelry beads to add a pretty touch. 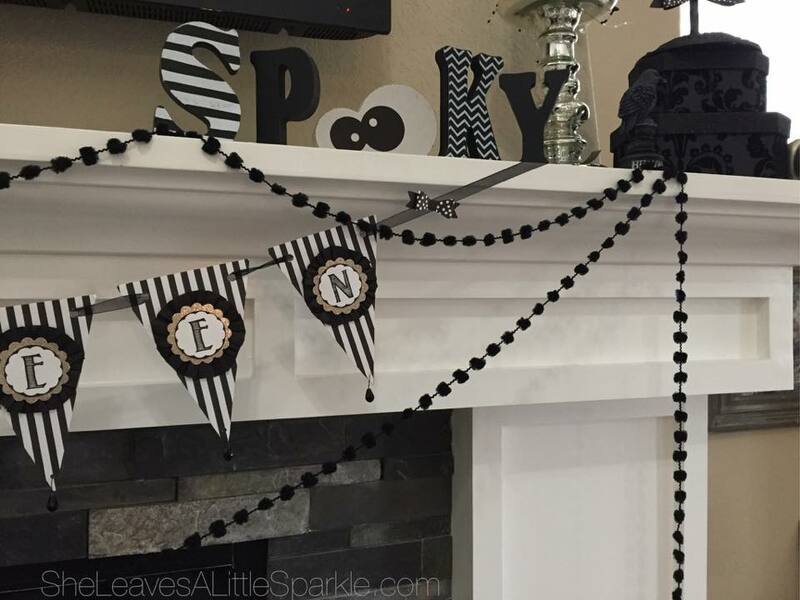 Small paper bows and fun black pom-pom strands are from Michael’s. 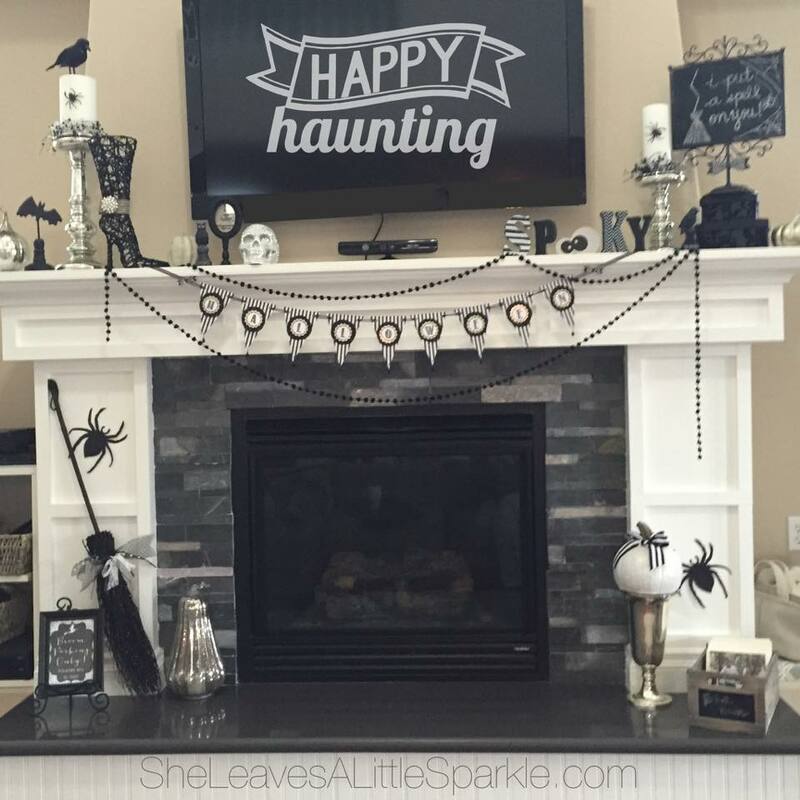 Did you see these cute “Spooky” blocks at Target? Only $3 in the dollar spot! 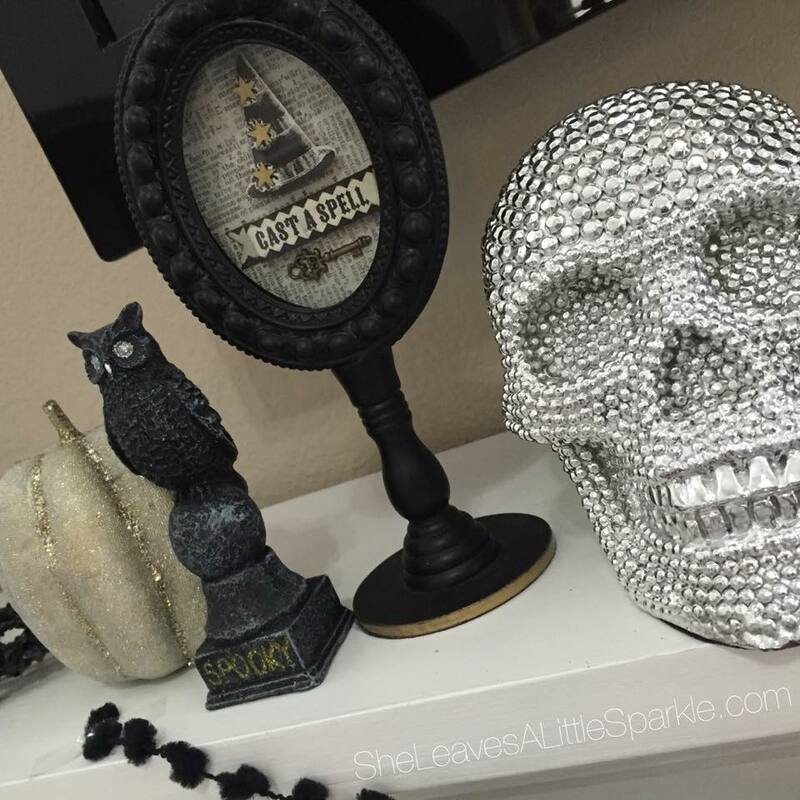 The pumpkin and owl were finds from the Dollar Store and the cute sign is from Rod Works and the sparkly skull is from Target. 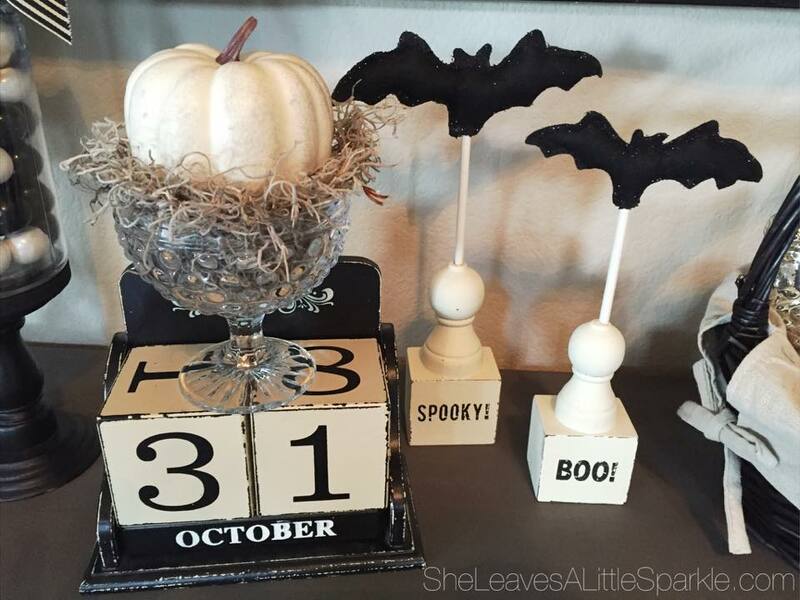 The bird and silver pumpkin are Dollar Store finds. Mercury glass candlesticks are from Home Goods. Chalkboard is from Rod Works. They still carry them. 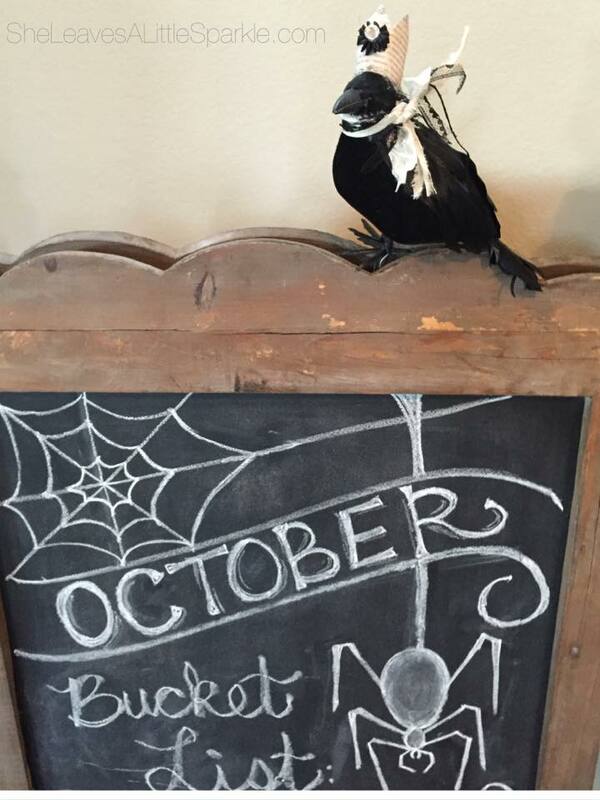 I love adding a lot of chalk art around Halloween! And it’s good practice and feels just a tad easier each time I do it. But honestly….I am NO artist and have horrible handwriting so the struggle is REAL (and painful…i mean, major hand cramping when I’m done – LOL!). Now…on to my buffet vignette…. 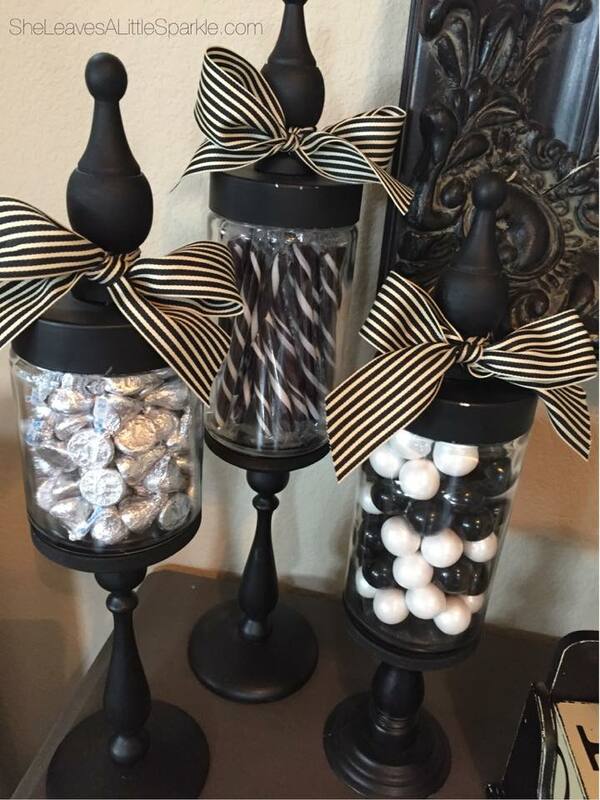 I love candy apothecary jars! Go to Party City and they will have candy in all colors for whichever Holiday or theme you are decorating for! I made these apothecary jars from a tutorial HERE. I had everything at home except for the cute finials on top. It was so easy! 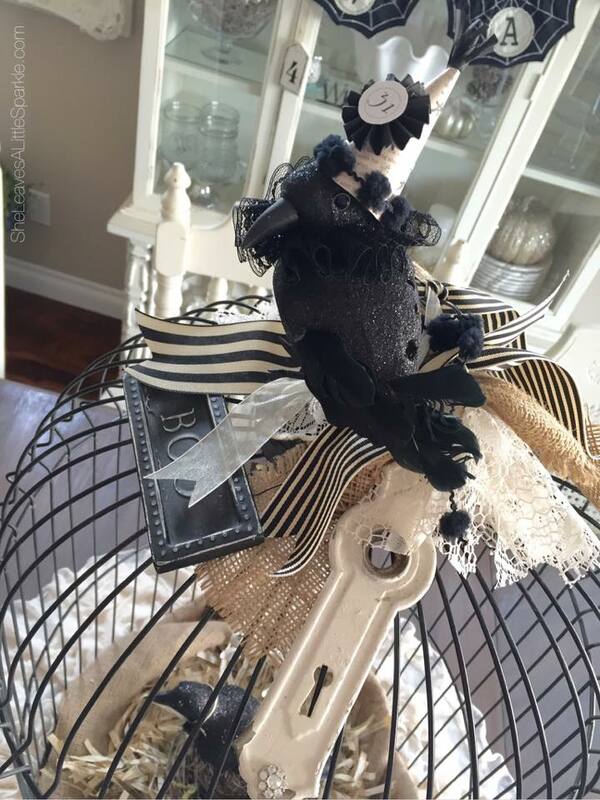 These cute spider web fans were at Michaels and then I added the center embellishments. 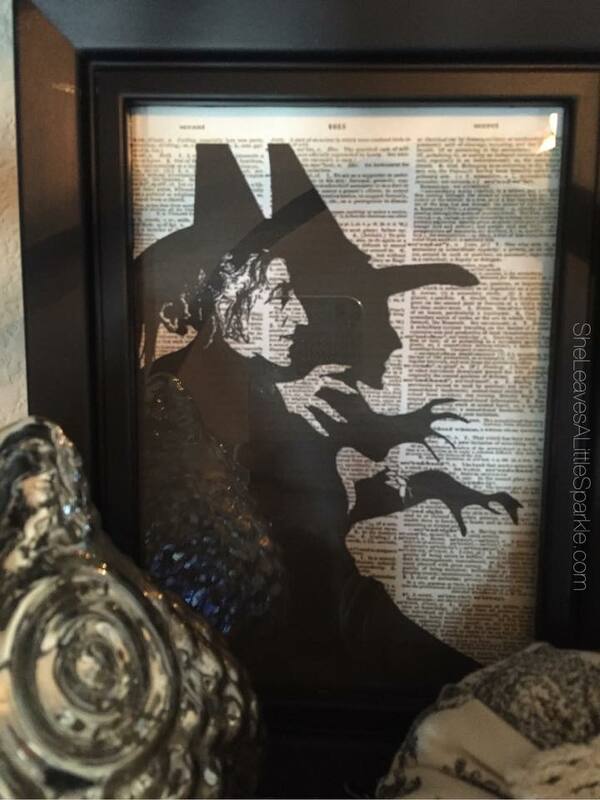 No Halloween would be complete without the Wicked Witch from Oz! 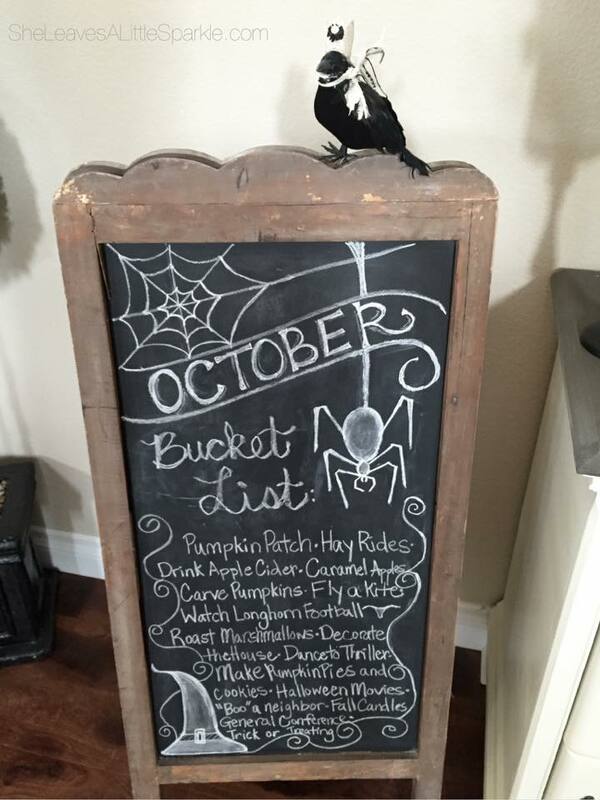 A full view of the Bucket List…. 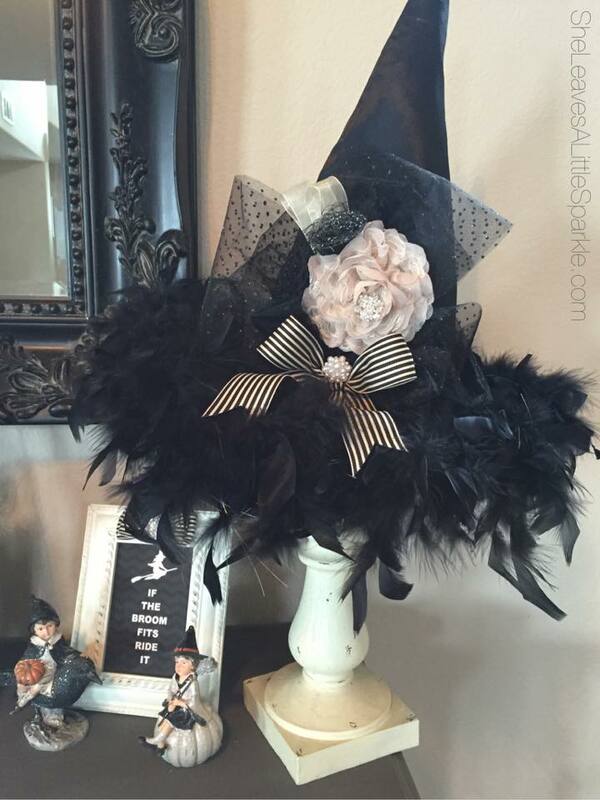 Halloween never comes and goes without me wearing my most FAVORITE witch hat! I changed out all the embellishments this year and made it a little more elegant and shabby chic. I’m sort of in loooooove with it!!!! I made this print a few years ago but can’t seem to find it on my computer anywhere! I’ll have to recreate it and share it with y’all soon! How cute are these sparkly little witches my mama bought me?!! They’re just the most adorable pair ever! 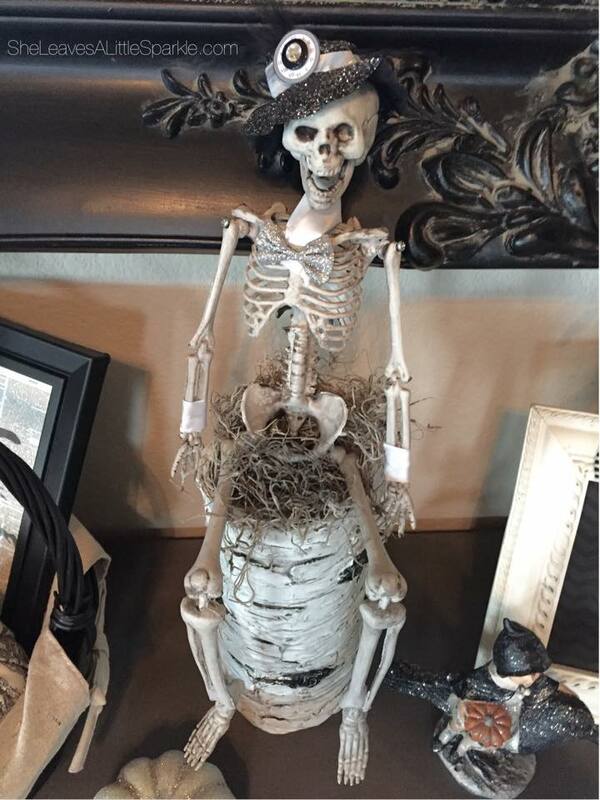 Of course, Mr. Skeleton had to get a little embellished too or else he’d be too plain for this vignette! Oh! 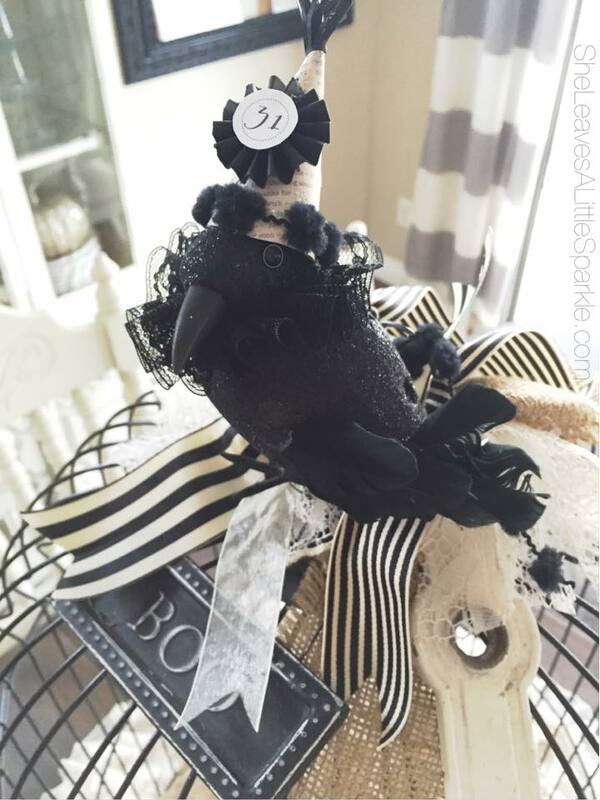 That cute basket…I found it at TJ Maxx and I can’t remember where I found the black feather wreath but I did add the ribbon and jewels. So, that’s my buffet. Very elegant and shabby chic right?! I sure do love it! I love this little sitting area. I had this chair recovered that was passed down to me by my Great Aunt Wanda and I always loved it growing up (I just preferred it not to be in red velvet…wink wink). Can you believe that I found this adorable little “Boo” pillow for $3 at the 99 Cent Store?!! Shocking, I know. And I love it. 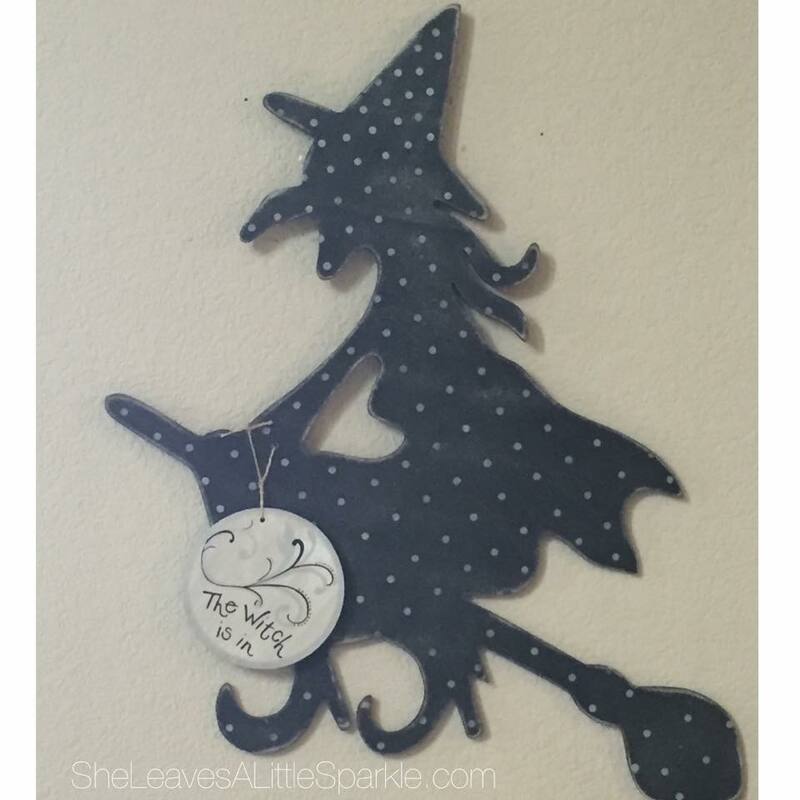 When we lived in Utah briefly (years ago), I found this darling polkdot witch at TaiPan Trading. 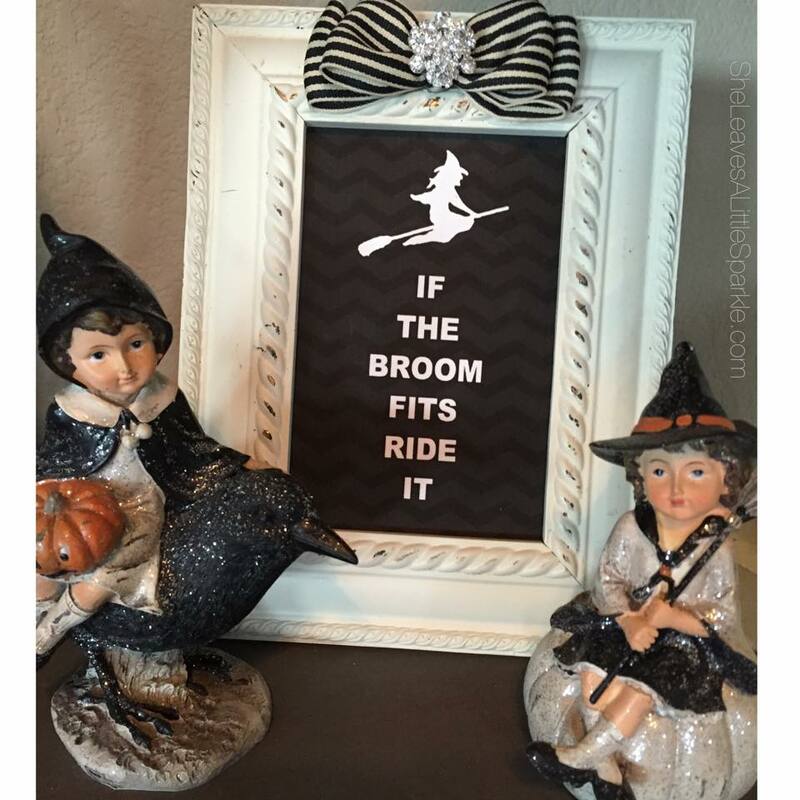 The other side says “The witch is out” but let’s face it….it’s more fun when she’s in! Ha! Isn’t it fun??? 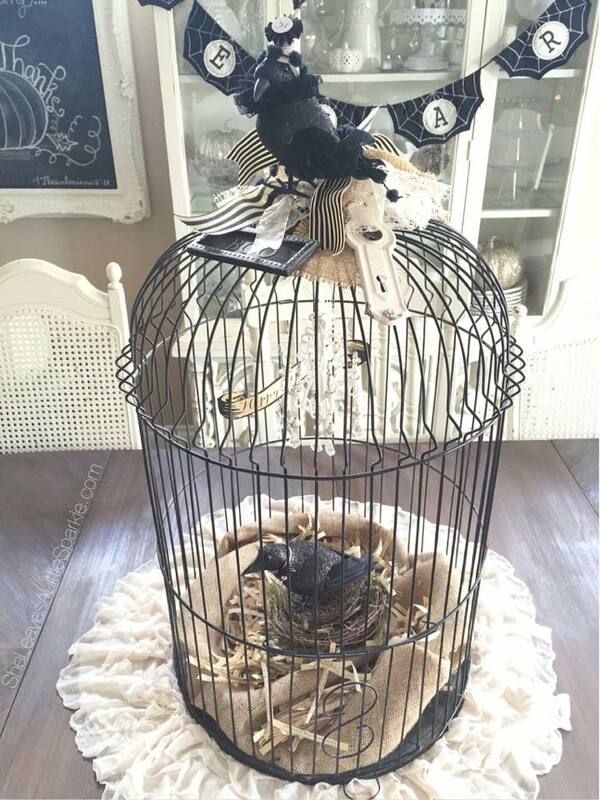 I used my ivory ruffle blanket as a sort of placemat or skirt around the cage. The chandelier in side is an ornament I found at Christmas time. I even gave this guy a little accessory and banner of his own. 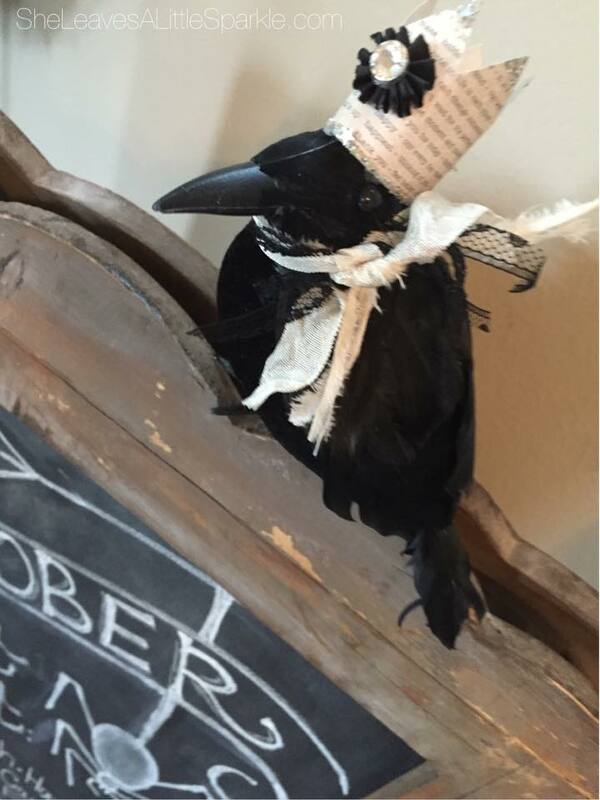 I put burlap down and shredded book pages and a nest to give it this cozy look. 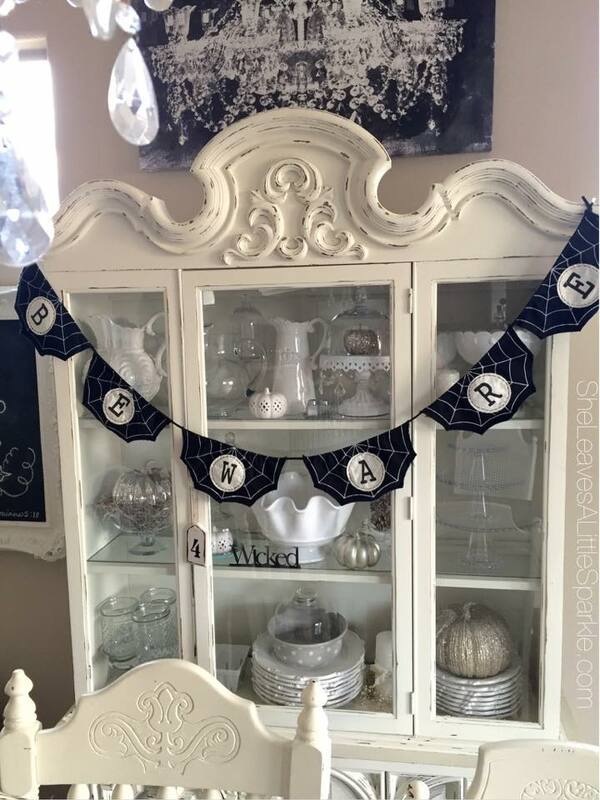 I almost forgot about this banner that I found in September from Home Goods! It was the perfect thing to string across my ornate hutch. 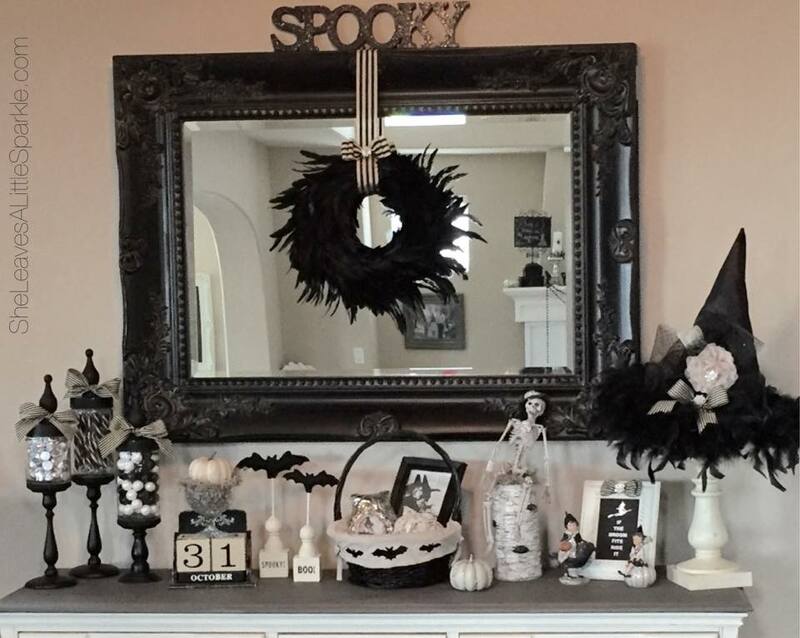 And remember all of those pumpkins that were on my table from THIS post? I just added them inside my hutch and around my mantel and buffet. 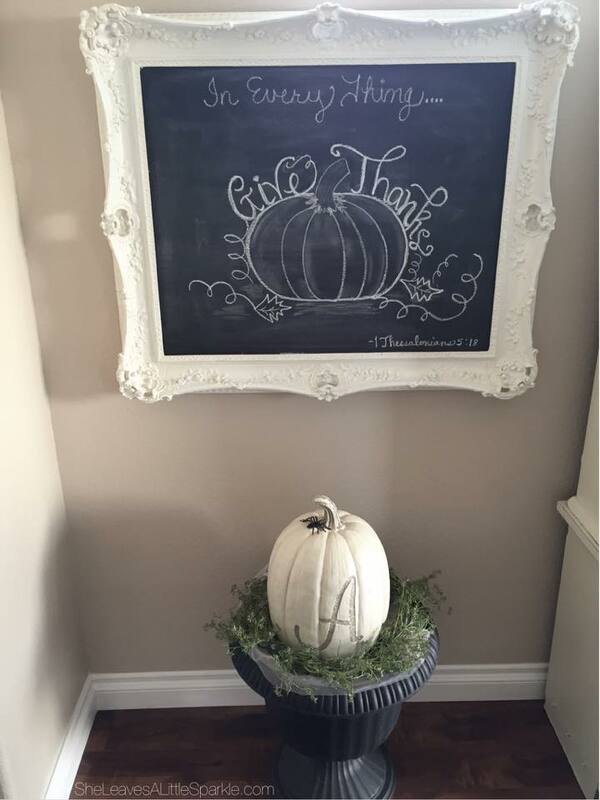 I did this chalkboard art for fall in general. I wanted to change it for Halloween but THEN remembered that it took me over an hour and I was like…never mind that! LOL! 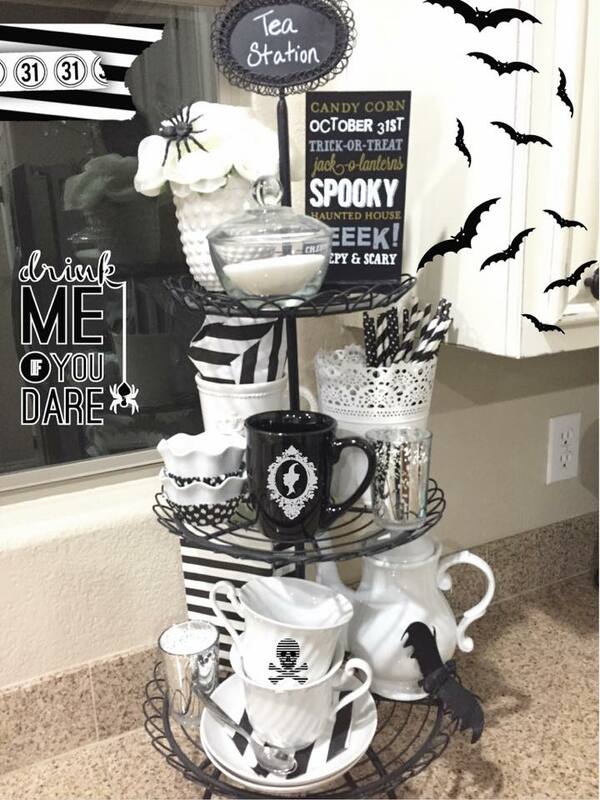 This Tea Station of mine HAD to have a quick makeover for Halloween! Again, all stuff I had in my home…you just have to start grabbing things and being creative! I’m pleased with how it turned out! The last thing I’ll share with you is this cute idea I like to do all year long. Large cloches (that glass dome) are GREAT for decorating. 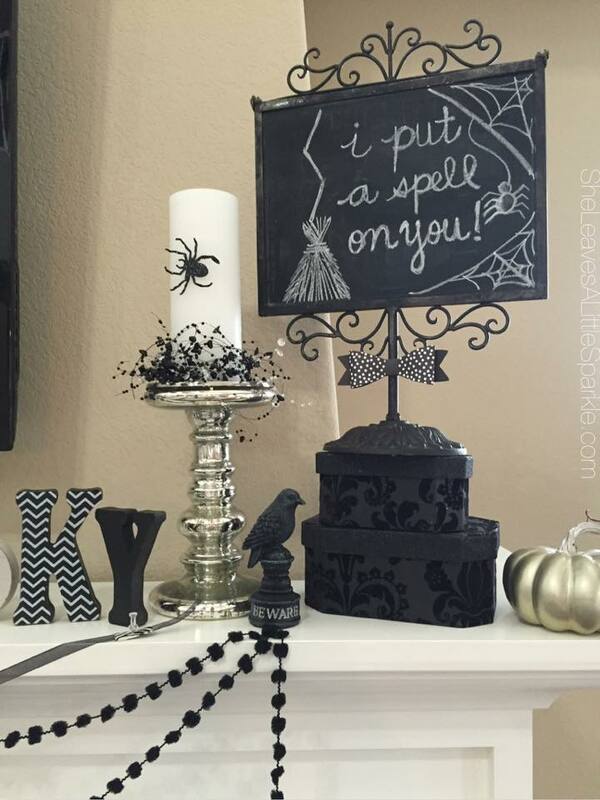 You can put it over a small topiary, a birds nest, a sign, a candle…anything! I like to use it this way to in the kitchen to double as decor AND a fun way to serve and display beverages for a party or just any time! I had these out for our Family Movie Night and my family went crazy over it! 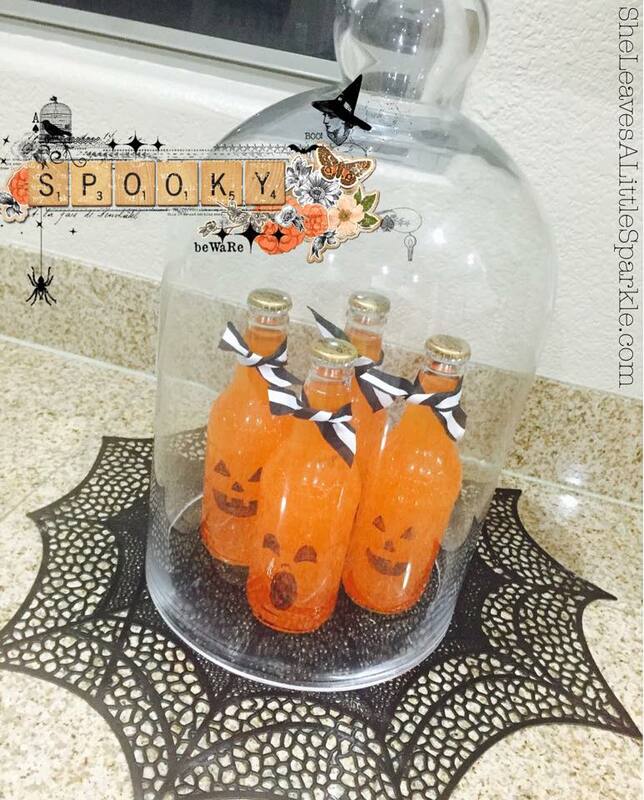 Just grab some Stewart’s Orange Cream Soda bottles, tear off the wrapper, tie on a cute little ribbon, and then use a dry erase or Sharpee marker to draw a jack-o-lantern face on it. I found this darling placemat at my local Smith’s Grocery Store. So fun! Well, that’s it for now! I still need to decide what exactly I’m doing for my entry way and then I’ll share that as well. Thanks so much for coming with me on this short little tour! 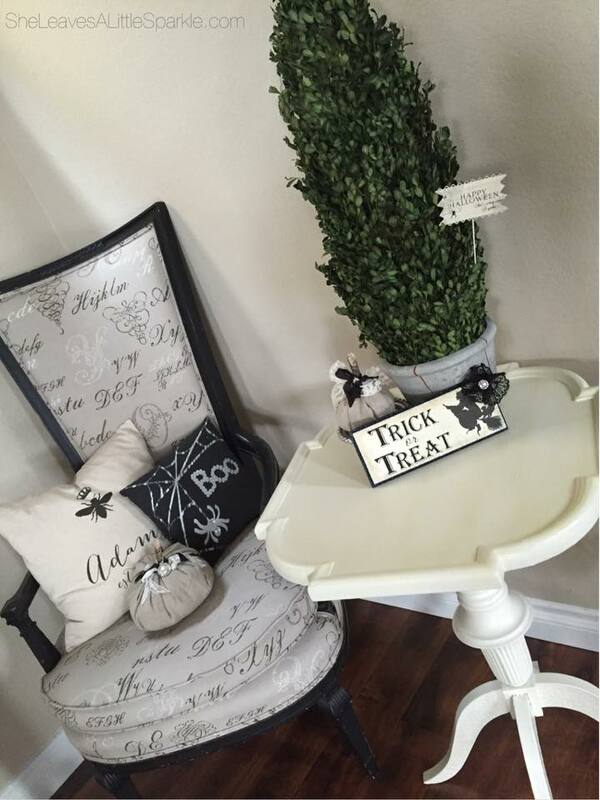 Share with me some of your favorite decor ideas for Halloween! 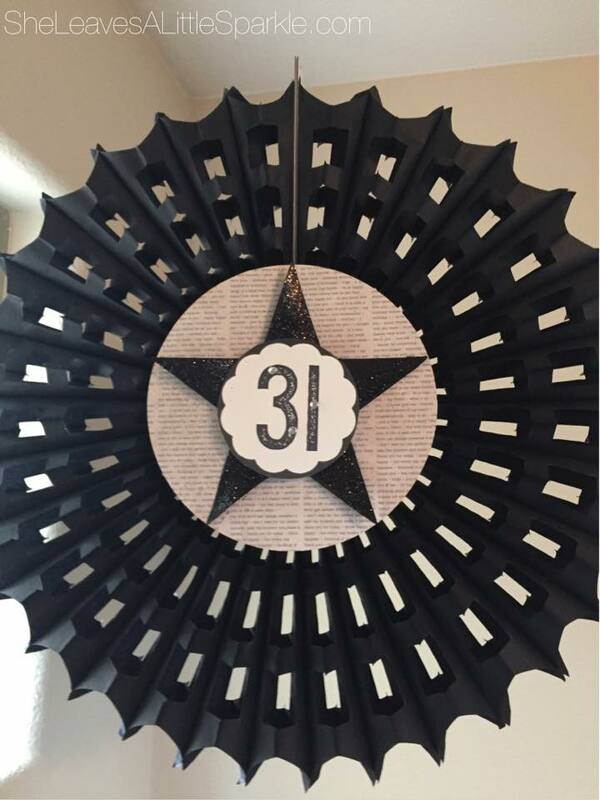 And don’t forget…if you loved these ideas, PIN and SHARE! Everything is fabulous, but I especially like the little chandelier in the birdcage!!!! !